New research by the University of New England has found that facial hair affects how quickly people recognise certain emotions. 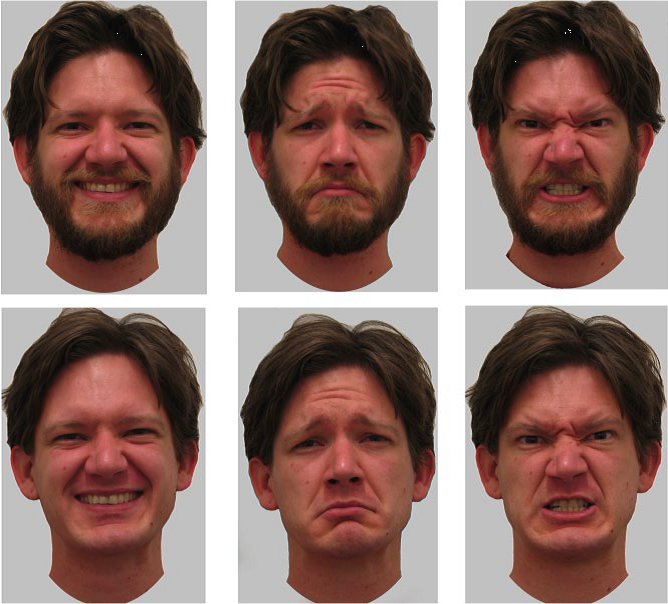 Image: These images show the same man posing happy, sad, and angry expressions when bearded (upper row) and clean-shaven (lower row). Image by Barnaby J.W. Dixson. Psychologist Robert J. Pellegrini has famously said that inside every clean-shaven man, there is a beard screaming to be let out. Beards are also arguably one of the most obvious signals of masculinity in humans. Now, new research by the University of New England has found that facial hair affects how quickly people recognise certain emotions. Expert in emotional perception, Dr Belinda Craig from UNE’s School of Psychology and her team, has published research findings on how having a beard impacts communicating certain emotions as opposed to being clean-shaven. The study compared clean-shaven faces to, minimum six-week old untrimmed beards and considered three emotions: anger, sadness and happiness. “These were the emotions that were relevant for our study as they related to interpersonal threat and signaling aggressiveness and status,” Dr Craig said. “We asked people to recognise emotional expressions and found that they are faster to recognise anger when there is a beard than when the face is clean-shaven,” Dr Craig said. “Interestingly, we found that people were slower to recognise sadness on a bearded face than a clean-shaven face. “We think it’s because the beard emphasizes the jaw which makes it easier to recognise anger but it is concealing some of the signals of sadness. ”The researchers further found that when people were asked to rate smiling, bearded faces they were rated as more prosocial. Dr Craig’s research is closely associated with previous studies that have looked into why beards exist. “Almost 150 years ago Darwin suggested that beards evolved to communicate formidability and status to other males. Recent studies have found that bearded faces are rated more masculine, dominant and aggressive than clean-shaven faces. But interestingly, no studies have investigated whether beards enhance recognition of threatening expressions like anger,” Dr Craig said. The message for beard lovers is a mixed one – having a beard may help you in the boardroom, politics or sport by looking dominant and intimidating. On the other hand, having a beard can be a bit of liability when you’re feeling sad and are looking for social support.